Gross Area: 148,995 sq. ft. The design for Bowie State University’s New Center for Natural Sciences, Mathematics and Nursing (CNSMN) directly addresses the mission and strategic plans put forth by the University System of Maryland, the Governor’s STEM Taskforce, and Bowie State’s expressed goals to produce highly skilled graduates in the scientific, mathematical, engineering, technological, and health professional fields. 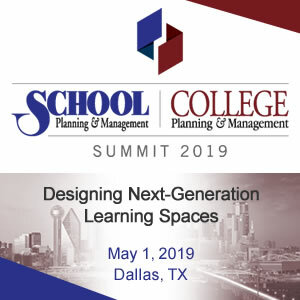 The design strategy intentionally collocates mathematics, natural sciences and nursing into one connected community with shared facilities, resources, and programs. The 148,995 square-foot Center includes multidisciplinary undergraduate teaching laboratories, research laboratories, and active learning classrooms for math, engineering, nursing, biology, chemistry, physical sciences and blended disciplines. Select biology labs are a hybrid active learning classroom and wet lab all in one, increasing utilization and functionality over the life of the building. A greenhouse that supports teaching and research, a “real world” nursing skills simulation suite, and other specialized core facilities, show the commitment to a fully layered education. A light-filled three-story central learning and display space contributes to an overall goal—to fill the building with glare-free daylight. 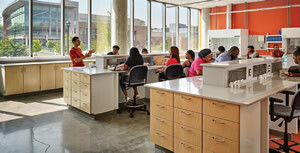 Informal seating and work zones provide direct access to classrooms and laboratories. The fractal-based brand expression inspires visitors, students and faculty. Project rooms, collaboration stairs and bridges create places for small groups of students to join together before and after class, work together on their coursework, and form relationships that will serve them for the rest of their lives. One wing holds most of the labs, with a lab oriented HVAC system, while the other wing includes the nursing/health science learning and simulation suites, classrooms and the majority of the offices. This allows for energy efficient and flexible systems to serve each occupancy type in a smart way. 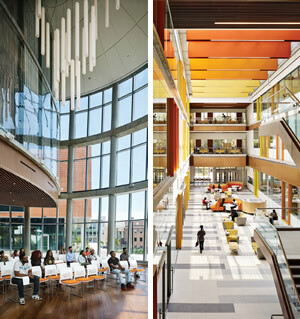 A unique and iconic feature of the Center is the three-story, elliptical multipurpose room, which acts as a visual and functional beacon to express the University’s commitment to STEM and nursing education. 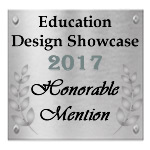 This space features dynamic glass by SageGlass, which tints on- demand to create a more comfortable learning environment. This dynamic glass, which was also used on the building’s large east and west-facing curtain wall, maintains access to natural light, while protecting occupants from glare and excess heat throughout the day. Professors are able to customize solar control for individual classrooms and labs. Much of the Center for Natural Sciences, Mathematics and Nursing is on display. Classrooms have glass walls so that students passing through the sun-filled atrium or other parts of the building can spot what’s happening, or imagine what is possible. Outdoor gathering space designed as dual purposed classroom and social assembly. Stormwater features mitigate management issues in artful designs. Fractal patterns of design related directly to the teaching program of the building including pavement, water features, and benches. Native drought tolerant plants integrated to minimize water use. The Nursing Education wing includes three functional suites for a realistic simulation environment. Standardized patient exam rooms and clinical skill areas include the equipment that students and professors need to support the full range of experiences for nursing education. The multifunctional space will also allow Bowie State’s Nursing program to adapt to meet curriculum changes and increased demand. Simulation technology is easy to spot in the area for nursing students. These simulation rooms are set up like a hospital or clinic, beeping monitor and all. There’s a high-tech mannequin in a hospital bed, cameras, microphones and software to capture students’ actions, and a two-way mirror so instructors can watch from a control room. “The intent is that we will be able to mimic, to a very authentic level, those expected experiences that students must confront as graduates or as new RNs,” said Rena Boss- Victoria, Nursing department chair. “That’s the ultimate goal.” Highly qualified, expertly trained Bowie State graduates will help fill the gap in the number of skilled nurses needed to fill jobs today and in the future. Instead of the typical solution of placing the greenhouse on the roof, this project chose a more difficult architectural and engineering solution of putting the greenhouse on thethird floor to give more direct access and visibility to the main laboratory floor. The greenhouse becomes a primary science-on-display opportunity. All of the classrooms and instructional media systems are designed to implement the full range of pedagogies. The engineering labs, which connect to 3-D printer rooms, provide students with the opportunity to witness real-time results of their work. 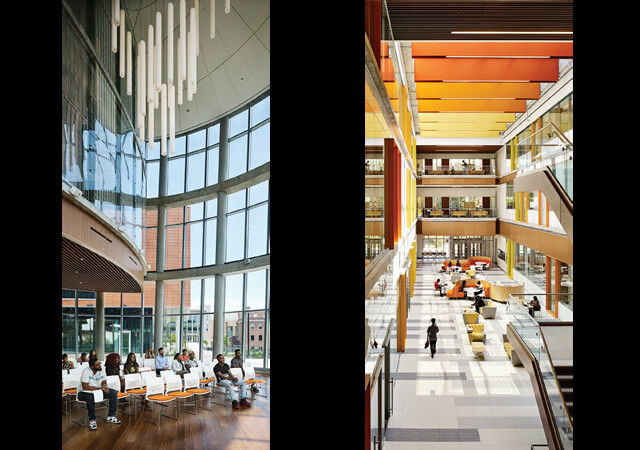 A unique graphic and digital package for brand expression was developed by Perkins+Will to differentiate BSU and establish a unique sense of place in the building. Inspired by patterns found in fractal geometry, African art and nature, colorful wall coverings create bold mosaic-like shapes that honor the three academic disciplines housed within the building. 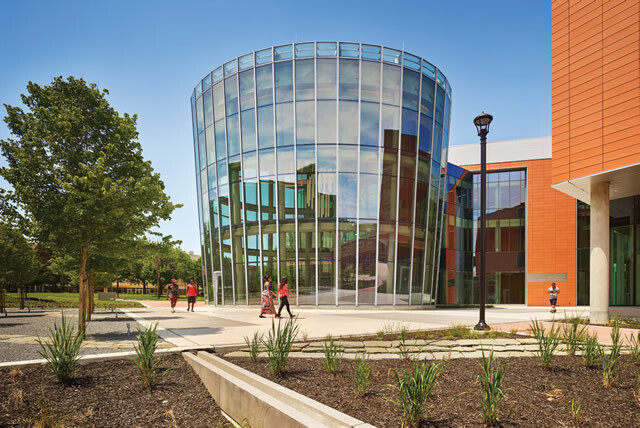 The Bowie State University Center for Natural Sciences, Mathematics and Nursing features one of the nation’s largest installations of dynamic glass, which contributes to the project goal of LEED Gold Certification. By blocking sunlight on hot days, the SageGlass will help dramatically reduce energy demand in the building. SageGlass also reduces the building’s reliance on overhead lighting. Other dynamic glazing benefits include unobstructed access to outdoor views and significantly lower heating and cooling costs over time. Chilled beam heating and cooling systems separate the fresh air ventilation needs from the thermal load, dramatically reducing energy costs for heating and cooling. Indirect LED lighting contributes to a very low watt/square-foot power density, and a glare free learning environment while eliminating harmful mercury that is a part of fluorescent lighting systems. The interior detailing is compelling. A very good balance in use of materials; ranks high sustainability-wise. The extensive use of glass promotes connection, interest. Beautifully detailed building.